The right orientation of drawings is important when using automated print output via large-format devices if connected to an online folding machine. Technical drawings must be rotated in such a way that the legend is visible at the top of the paper batch to the folding machine. Automatic rotation can be difficult in some cases, however. Differentiating between landscape and portrait orientation, or rotation to the orientation required for the output device, can be easily done. What’s not easy is recognizing whether drawings are right-side up before or from automatic rotation. 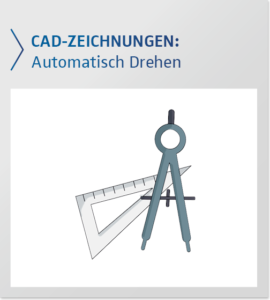 CAD drawings are stored and managed in the document management system (SAP-DVS, ECM, etc.) by the engineering department or by suppliers. These large-format drawings are then saved in neutral format (PDF/A, or previously TIFF) in an automated process. These documents find their way into the system via different routes. The classic way is the processing of a CAD drawing scanned by the supplier or from an ECM workflow from the email client. A company’s own design drawings are mostly loaded via CAD interface from the engineering department into the ERP system (SAP PLM) along with the associated BOM. In any of these different workflows the 2-D drawings can be stored in the wrong orientation. A drawing with the wrong orientation usually isn’t noticed at first. When other users look at these drawings later, it can be awkward for them if they have to rotate the drawings in order to look at them properly. With automated plot output, this rotation must happen automatically. Before the CAD drawing is issued over the plot management from PLOSSYS netdome, inspection and correction can be carried out according to specific criteria. Here, the correct rotation of the drawing is checked and automatically carried out. Only in this way can the plotter and the connected folding properly handle the drawing. Whereby it must be decided whether the folding machine is to anticipate the legend before the drawing (e.g. Oce/Canon) or after it (e.g. Rowe). In any case the legend must be visible at the top of the folded batch. Companies might have their CAD drawings stored optimally for the folder of a certain manufacturer. Switching output systems may then lead to massive problems. Here it’s worth carrying out the inspection, not right before printing, but rather earlier over the entire archive or document management system, and correcting the orientation accordingly, so that document types and classes in SAP DVS or PLM systems can be defined and checked. For this, SEAL Systems has developed and implemented its own SAP transactions. Texts can be automatically searched in PDF files. In practice, however, there are very different representations of texts, so that the orientation of the file cannot be determined with certainty in a PDF search. Therefore, the legend is searched using OCR text recognition. Activation of this feature requires an additional paid license. If you’re having problems with getting the right orientation with plot printing, talk to us! Have questions? Contact us for a non-binding consultation! 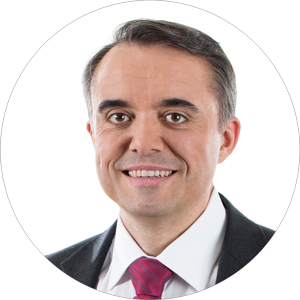 As an IT expert André Schnibbe always considers the big picture in a customers solution – nevertheless it has to do with document related processes, innovative SAP spool analytic tools or mobile printing as a part of a holistical Output Management system. This behaviour fits with his passion to climb a difficult fixed-rope route. This only works with liability and mindfulness without hectic rush.